A portfolio of solutions will be considered to achieve sustainable groundwater under SGMA. Projects and management actions can work in tandem to augment water supply and reduce water demand, stabilizing groundwater levels. The North Fork Kings GSA Board’s first priority is implementing projects to increase water supply in the service area. The North Fork Regional Recharge Project introduced by Kevin Johansen, Provost & Pritchard, aligns with that priority. The project is in early conceptual stages. Three groundwater recharge basins with estimated annual recharge capacity of 15,000 AF (acre-feet) are included in the project scope, leveraging suitable recharge conditions in the GSA’s northeast region. The average annual cost per AF of recharge is $160 according to preliminary project cost estimates. The project includes two new basins and expansion of an existing Laguna Irrigation District basin. An additional component needed is improvement and expansion of Liberty Canal to increase current carrying capacity and secure water delivery. Surface soil type, absence of clay layers, and groundwater flows at project sites are highly conducive to recharge that benefits the entire GSA’s service area. The bulk of surface soils at proposed sites are coarse sands and sandy loam, ideal for percolation into the groundwater aquifer below. And although much of the GSA is underlain with clay layers, the northeast region is absent of these layers. Because groundwater generally flows east to west in the GSA, the groundwater recharged by the project would flow into the rest of the service area. This includes to disadvantaged communities of Lanare and Riverdale where soil type and clay layers are unsuitable for recharge projects. To help cover project cost, the North Fork Kings GSA is pursuing grant funding through Integrated Regional Water Management (IRWM) Prop 1 Implementation funds. 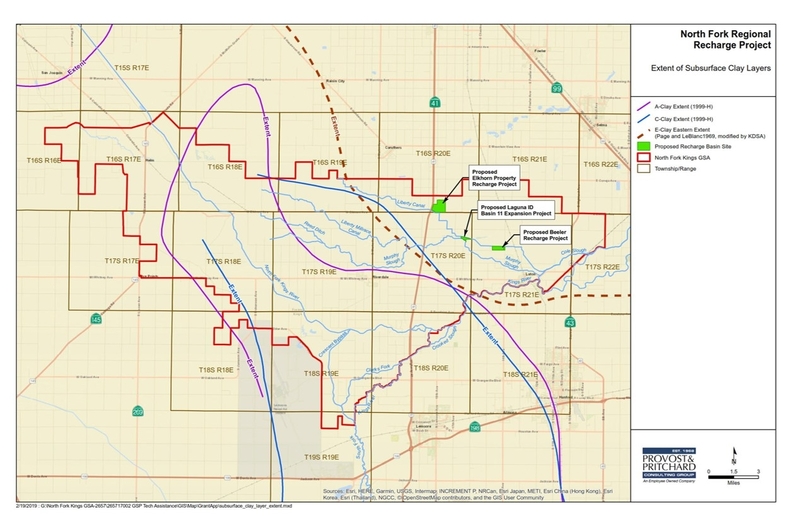 A pre-application was sent to the Kings Basin Water Authority for review and if selected, will compete for funding from a pool of $12.7 million for the Tulare Kern Funding Area. The seven Kings Subbasin GSAs have reached agreement on an initial overdraft amount for the Kings Subbasin of 122,000 acre feet. The North Fork Kings GSA estimated amount of the 122,000 acre feet is 50,300 acre feet. The North Fork Kings GSA Board has already identified potential projects to begin correcting the target overdraft amount by the SGMA sustainability deadline of 2040. There are two basic ways to achieve sustainability and eliminate overdraft: increase water supply or reduce water demand. 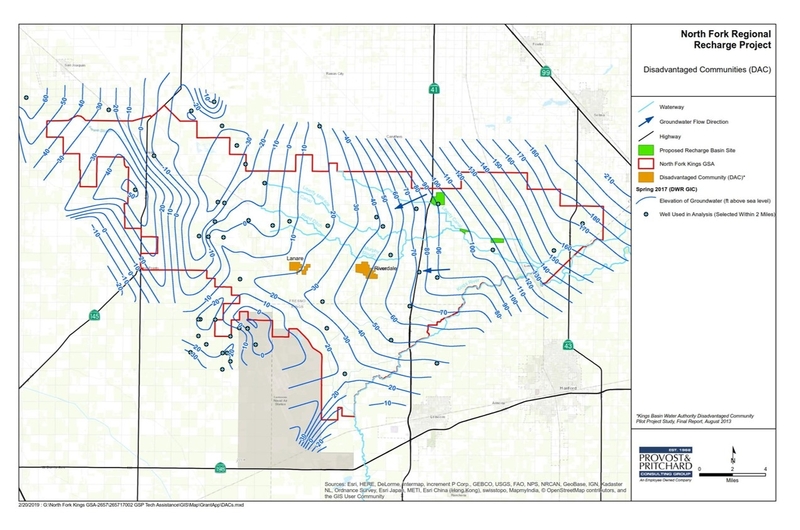 The Board’s first priority is to increase water supply, but there are hurdles for this course of action within the North Fork Kings area including availability and frequency of additional water; all Kings River water is allocated through a water rights schedule; and the service area has physical constraints for recharge including soil types and a limited distribution system. The map below (click map to enlarge) shows the general soil types in the North Fork Kings GSA. The green areas in the eastern portion of the GSA are sandier soils and more conducive for recharging the aquifer. The western portion has heavier clay soils that are more impermeable and consequently poor for recharge. Although the eastern part of the service area has better soils for recharge, it lacks a distribution system. Therefore, infrastructure needs to be constructed to deliver water to any future recharge projects that may be built. The map below (click map to enlarge) represents significant surface water features in the North Fork Kings GSA. 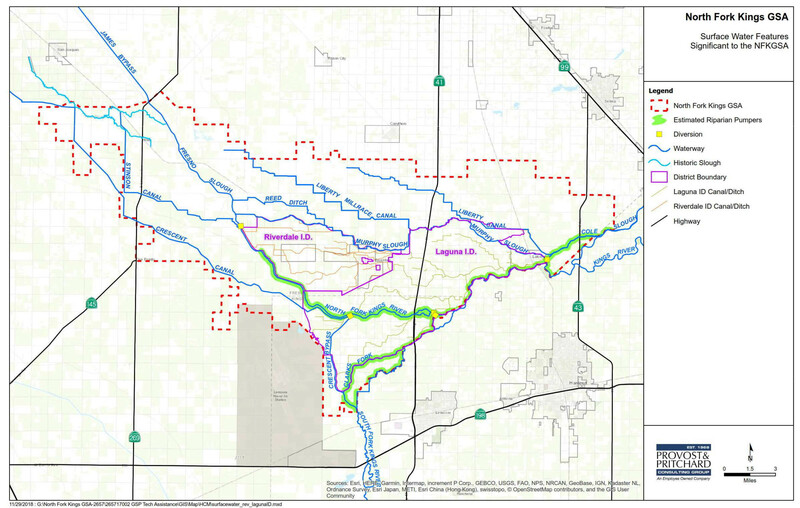 North Fork Kings GSA preliminary project list contains nine groundwater recharge projects yielding an estimated annual average of approximately 20,000 acre feet per year. Additional projects will need to be identified to alleviate the overdraft amount. If water supply tactics are not sufficiently successful to eliminate the 50, 300 acre feet overdraft number then management actions to reduce water demand will need to be implemented. At the October 24th Board Meeting the North Fork Kings GSA Board approved to submit an application for Technical Support Services from the CA Department of Water Resources (DWR) in a move to solve data gaps in the monitoring network. Services available through DWR include the installation of dedicated monitoring wells and video logging to gather construction information on existing wells among others. Sustainability mandates under SGMA necessitate data-driven groundwater management. A Groundwater Sustainability Plan requirement, the monitoring network is a key data gathering component for establishing and monitoring sustainability goals in the North Fork Kings GSA. Data collected from the network of monitoring wells must be reported annually to DWR; the data will also be an important metric for the North Fork Kings GSA to measure the impacts and results of future projects and management actions on groundwater levels within the service area. Current groundwater condition insights are drawn from existing monitoring programs including CASGEM (California Statewide Groundwater Elevation Monitoring) and GAMA (Groundwater Ambient Monitoring and Assessment Program), but increased data capacity is needed to sufficiently monitor sustainability progress and ensure the GSA is achieving its mitigation targets. The GSAs technical consultant, Kevin Johansen of Provost & Pritchard recommends a network density of 2-3 monitoring wells per township. Because of the hydrogeologic variability of the area, which includes multiple clay layers, a confined aquifer, and an unconfined aquifer (unconfined aquifer exists in the absence of clay layer), sufficient network density is important in the North Fork Kings GSA. Both existing and newly established dedicated monitoring wells will be used to fill gaps and achieve the recommended network density. To qualify for the monitoring network a well must be accompanied by a Well Completion Report, a document outlining the construction information such as depth and perforated intervals. Because it can be time-consuming work to obtain and match reports with the appropriate well, the GSA plans to take advantage of the Technical Support Services offered by DWR for the installation of dedicated monitoring wells pending application approval. The well monitoring network will ultimately be the data collection tool providing insight into the trajectory toward sustainable levels of groundwater in the North Fork Kings GSA. The Technical Support Services offered by DWR can help efforts of the GSA to sufficiently monitor groundwater levels. At the June 27, 2018 North Fork Kings GSA Board Workshop, technical consultant Kevin Johansen of Provost & Pritchard provided a detailed update on Groundwater Sustainability Plan (GSP) elements within the context of SGMA-mandated subbasin coordination. Because the State requires sustainability at the subbasin level, the seven Kings Subbasin GSAs are seeking agreement on the methodologies used to develop their individual GSPs. The coordination group is working towards an overdraft yield estimate within the Kings Subbasin, and are seeking agreement on a methodology to assign appropriate responsibility among each GSA for that overdraft amount. Work to determine unconfined aquifer (unconfined aquifer, as opposed to confined, exists in the absence of a clay layer) storage change and groundwater boundary flows is currently underway. Using best available monitoring well data, contour maps from the Spring of 1999 and the Spring of 2011 are used to determine aquifer storage change and boundary flows within the Kings Subbasin. Contour maps utilize groundwater elevation (feet above mean sea level) to illustrate the direction that groundwater moves. The map below (click image to enlarge) indicates groundwater elevation levels with numbers along the blue contour lines in the year 2011 in the Kings Subbasin. Water flows perpendicular to these contour lines from higher elevations to lower. 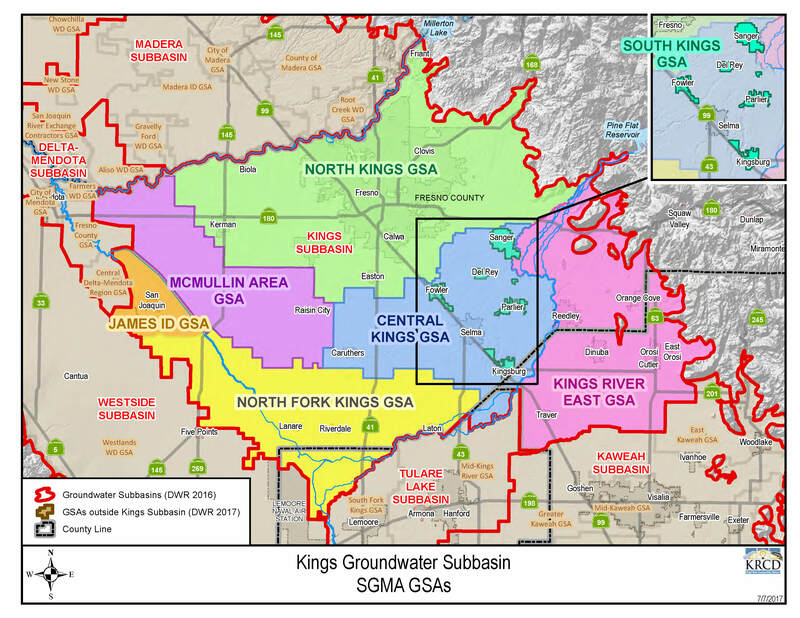 The map indicates Kings Subbasin groundwater generally flows from East to West. Please note that the elevation numbers are preliminary and subject to change pending improvements in well monitoring data. Preliminary numbers for unconfined aquifer storage change are calculated for each GSA in the subbasin using groundwater elevation data from 1999 to 2011. The subbasin as an entirety has experienced an estimated average annual storage change of 206,000 AF. Please note these numbers are preliminary and subject to change pending data improvements. A methodology for answering the important question of how much overdraft each GSA is responsible for must be agreed upon by the seven GSAs. Johansen outlined five potential methodologies for determining the apportionment of storage change responsibility. Methodology 1: The approach of this methodology is simply to prorate the subbasin total change in storage (the estimated 206,000 AF) amount based on GSA acreage – in other words, to equally distribute the total change amongst the GSAs by acreage. This method lacks causal explanation for change in storage. Methodology 2: The second proposed methodology utilizes only change in storage within the boundary of each GSA. This method lacks information on groundwater flow in and out of the GSA. Methodology 3: The third alternative takes into account the GSA’s change in groundwater storage and its groundwater boundary flows. This method looks at the estimated change in storage in a GSA, together with net boundary flow (water flowing in and water flowing out) to assign responsibility. Methodology 4: Identical to the third method, except that it accounts for historical flow patterns and its associated benefits or losses to a GSA over a period of time. Methodology 5: The final methodology utilizes the water budget concept. This method uses calculated water demands for each GSA depending on land use, and assumes that whatever demand not met by surface water delivery or precipitation is met by groundwater pumping. The current goal is to coordinate amongst the seven Kings Subbasin GSAs on an agreed methodology from the list above. No formal agreement has been made, but methodology 4 represents a holistic and equitable approach in calculating distribution of overdraft responsibility. Although a key component, change in storage is not enough to assign overdraft responsibility to each specific GSA because it excludes additional causal information such as groundwater flows and historical flow impacts. Assigning responsibility is key for each GSA’s individual GSP, as it sets a target for mitigation that can be achieved by projects and management actions. The presentation included preliminary calculations, and covered a broad range of GSP elements including Kings Subbasin Coordination outline in the above article, Water Budget, Sustainable Management Criteria, Preliminary Water Quality Characterization, Management Area Considerations, and Next Steps. Landowners residing in the North Fork Kings Groundwater Sustainability Agency (GSA) voted overwhelmingly in favor of a $10 per acre assessment to cover the costs of locally implementing the new State groundwater regulations. Following the closing of the assessment election public hearing on May 9th, the North Fork Kings GSA Board tabulated and certified the ballot results, which favored the local assessment by 94 percent. A majority vote was needed to pass the per acre benefit assessment; votes were weighted by acreage. The Board approved and set a rate of $10/acre for the fiscal year 2018-19. Each year, the Board will set a rate not to exceed the $10/acre maximum for the five-year lifespan of the assessment. 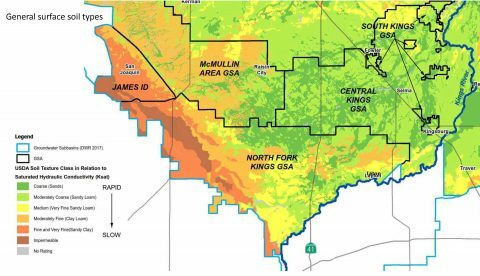 All landowners within the boundaries of the North Fork Kings GSA will be levied the $10/acre assessment via Fresno and Kings County tax rolls beginning in the fiscal year 2018-19. Passing the election is a success for the North Fork Kings GSA in keeping SGMA implementation at the local level. The GSA is equipped to move forward with development of the Groundwater Sustainability Plan. An Engineer’s Report was conducted to set the $10/acre assessment rate. The Report calculates the equitable distribution of the benefit derived from each parcel within the agency upon which such assessments will be levied. The Engineer’s Report discusses benefits of the Agency’s organization, proposed actions, and services provided by the North Fork Kings Groundwater Sustainability Agency. 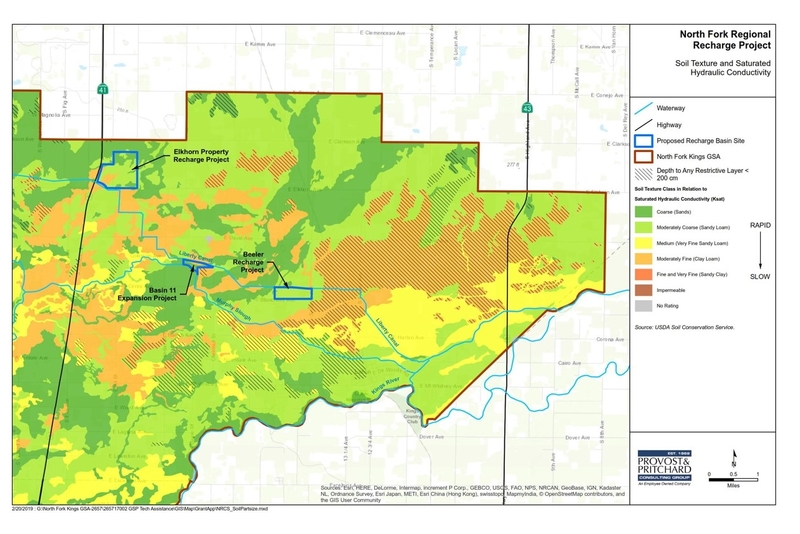 At the April 25th study session, North Fork Kings GSA technical consultant Kevin Johansen of Provost & Pritchard presented on the current status of Groundwater Sustainability Plan (GSP) development. 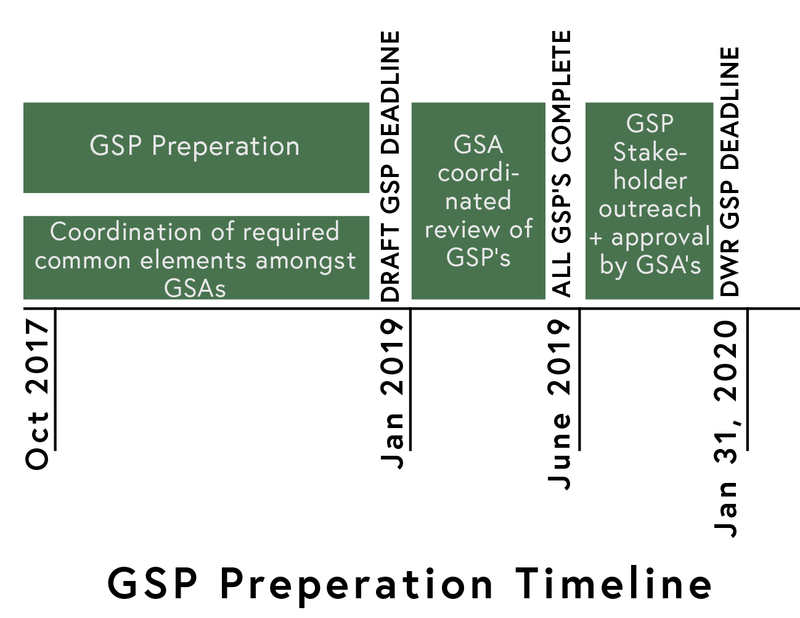 The presentation outlined technical requirements of the GSP and future milestones, a completed GSP draft by January 2019 being the nearest. 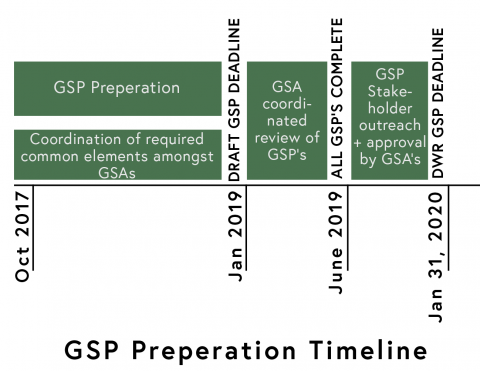 The goal is for all GSA’s within the Kings subbasin to complete individual GSP drafts by the January 2019 deadline, leaving enough time to coordinate a comprehensive subbasin GSP. Final GSP’s must be submitted to the CA Department of Water Resources (DWR) by the required deadline of January 2020. The timeline below indicates target deadlines. The Sustainable Management Criteria is one of several Best Management Practices (BMP) guidance documents created by DWR. These documents were created to provide clarification, guidance, and examples to help GSA’s develop the GSP. 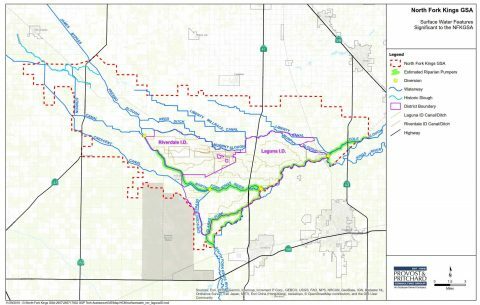 DWR defines BMP’s as “the practice, or combination of practices, that are designed to achieve sustainable groundwater management and have been determined to be technologically and economically effective, practicable, and based on best available science.” The BMP’s are guidelines for reaching sustainability by 2040 under SGMA. Provost & Pritchard discussed next steps to implement the Sustainable Management Criteria. Sustainability according to the Sustainable Management Criteria is achieved by avoiding “significant and unreasonable” results across six Sustainability Indicators. 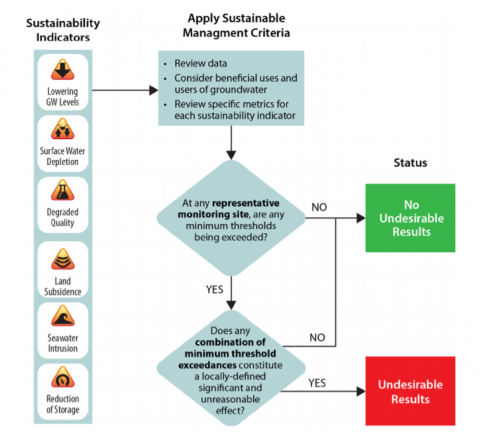 The consultants are working to coordinate amongst the seven GSA’s within the Kings subbasin to establish a methodology for defining “significant and unreasonable” results across the Sustainability Indicators. Once established, that methodology will be used by each GSA to set goals and define sustainability success. The six Sustainability Indicators are listed below. Seawater Intrusion is not relevant due to geographic location. Minumum Threshold – the lowest result allowed in the worst case scenario. A quantitative value that when exceeded cannot cause an “undesirable result” and thus cannot be an arbitrary number. Undesirable Result – a result defined by the GSA and approved by DWR in line with DWR’s suggested Best Management Practices. Undesirable results will be used by DWR to determine whether the sustainability goal has been achieved within a basin. Based on minimum threshold exceedances. If caused, sustainability is not successful. Measurable Objective – average maintained result over the long-term. Must be met by 2040. Success metric of sustainability across Sustainability Indicators. Each GSA will set its own results and objectives across the Sustainability Indicators using the methodology coordinated amongst the seven GSA’s in the Kings subbasin. For example, all GSA’s within the Kings Subbasin will use the same methodology to set their groundwater level minimum threshold, but for each GSA the specified level (lowest quantitative groundwater elevation allowed in the worst case scenario) will be different. 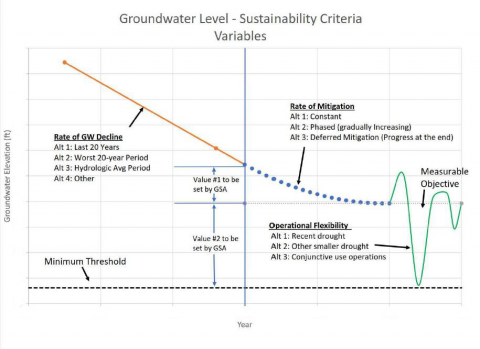 A closer look at the Sustainability Indicator: Lowering Groundwater Levels, illustrates the path toward sustainability under the Sustainable Management Criteria BMP. The relationship between Lowering Groundwater Levels, undesirable results, and minimum threshold is outlined in the flowchart below. To avoid “significant and unreasonable” results of the Lowering Groundwater Levels, the minimum threshold may not be exceeded to a level that causes undesirable results. Setting the minimum threshold and measurable objective values for groundwater level sustainability requires a methodology built using three sustainability criteria variables: rate of groundwater decline, rate of mitigation, and operational flexibility. 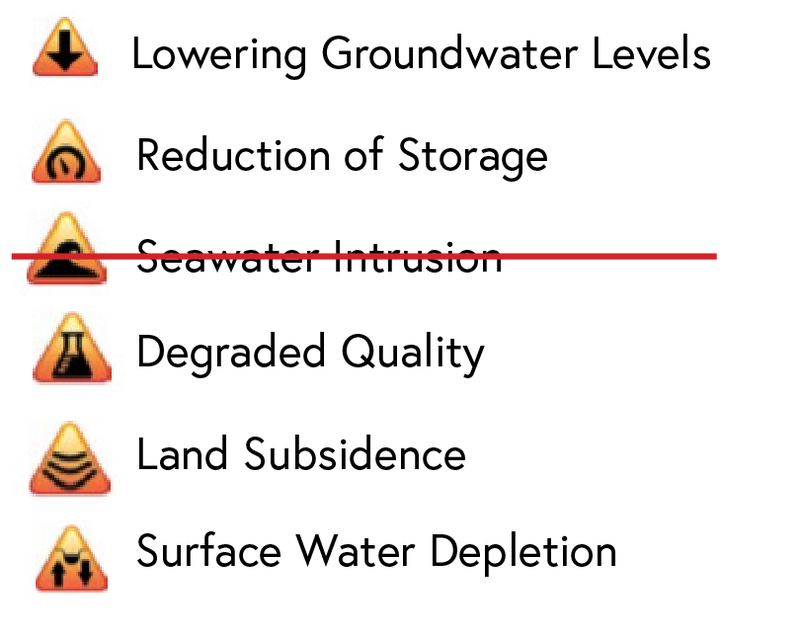 The graphic below illustrates these variables in relation to the change groundwater elevation. Each variable can be determined a number of ways, and once determined are used in relationship with one another to set quantitative groundwater elevation levels for the measurable objective and the minimum threshold. Provost & Pritchard is working to establish the methodology using the variables above. Using the example of Lowering Groundwater Levels, the technical consultants will recommend how to determine the rate of groundwater decline, the rate of mitigation, and the operational flexibility. The variables will then be used to establish the quantitative groundwater elevations for minimum threshold and measurable objective, and the rate at which the objective is achieved. 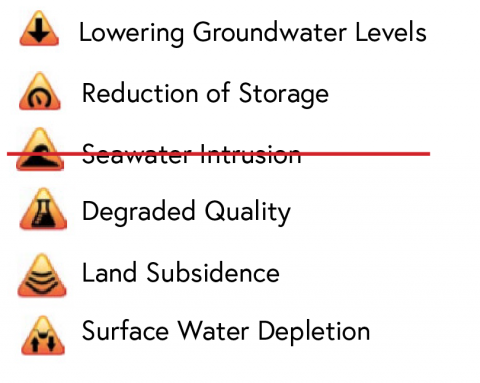 The North Fork Kings GSA will need to establish “significant and undesirable” metrics for each of the five relevant Sustainability Indicators. Realistic minimum thresholds and measurable objectives are key to reaching sustainability outlined by SGMA. Ballots have been mailed for the Proposition 218 Assessment. 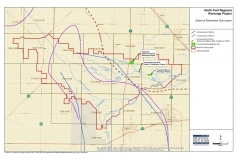 An assessment is necessary to generate sufficient revenue to fund local implementation of the unfunded State law, the Groundwater Sustainability Management Act (SGMA) and will be used to cover North Fork Kings Groundwater Sustainability Agency (GSA) costs and expenses associated with the development and implementation of a Groundwater Sustainability Plan. The proposed maximum annual assessment is $10.00. It is up to the Board to set the annual assessment rate, and the Board may choose to set the annual rate lower than the maximum $10.00 rate proposed. It is important that the North Fork Kings GSA has adequate funding to keep implementation of SGMA at the local level. Without the necessary funding to fulfill the requirements of the State law, the CA Department of Water Resources and Water Resources Control Board will step in as a backstop to implement the law. State-developed sustainability plans will differ from locally developed plans in cost, detail, and approach to sustainability. This includes but is not limited to: costly fees, higher frequency monitoring and reporting, and pumping restrictions. State intervention would be many times more costly than what is proposed by the North Fork Kings GSA. 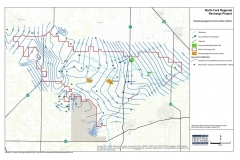 To access resources and additional information on the assessment and its purpose, visit our Prop 218 Groundwater Assessment page. Ballots must be received prior to the close of the Public Hearing scheduled for 5:30 pm on Wednesday, May 9, 2018, or they will not be counted.